What does every good holiday celebration need? Why, balloons, of course! 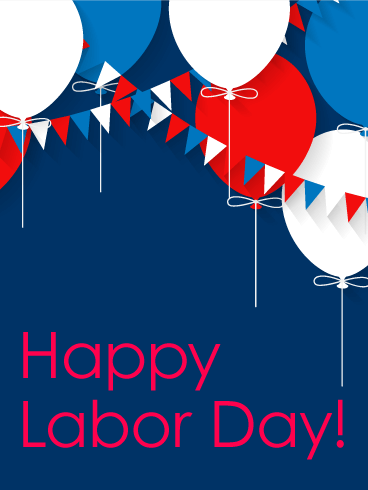 Add extra fun and excitement to your Labor Day celebrations with the patriotic balloons on this Labor Day card! 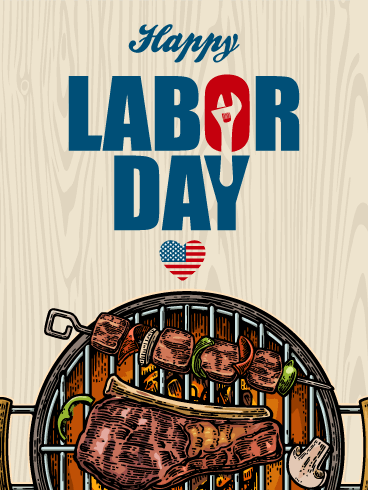 All of the best parties have great decorations, so send this Labor Day card to your loved ones to help them have a Labor Day celebration that will bring smiles to their faces! Do you have an ancestor who helped make America a safe and free home for future generations? 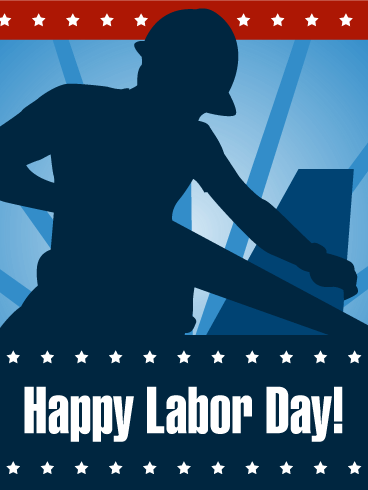 Then honor their sacrifices and hard work by sending this Labor Day card to your loved ones to celebrate the holiday! The red, white, and blue colors with the American flag will spark feelings of patriotism and help make this a great Labor Day! Labor Day is a day to remember the hard work and commitment that founded and protected our country, laws, lives, and freedoms. But, thankfully, it's also a day to sit back and relax with friends! 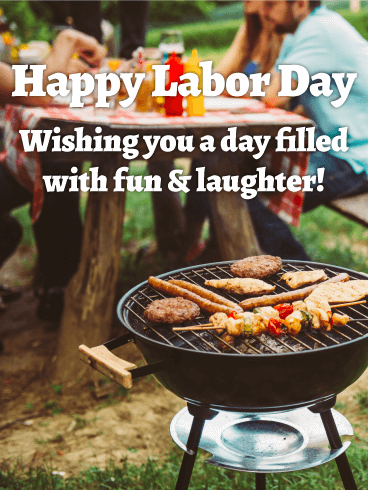 Use this Labor Day card to send well wishes and holiday fun to everyone you know! The fun message and picture will help make this a Labor Day celebration they will never forget! 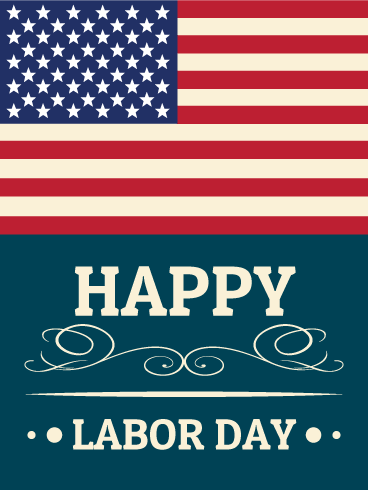 Every September, Americans gather together to celebrate and honor the hard work that created our nation. For most, these celebrations are filled with parades, cookouts, and time spent with friends and family - taking time off to remember their roots. To celebrate this year, send this fun Labor Day card to your loved ones! The design will prompt thoughts of their own parties and get them excited for the holiday! Every year, Labor Day comes right at the end of summer, giving Americans one last long weekend to enjoy the sun and warmth before autumn arrives. 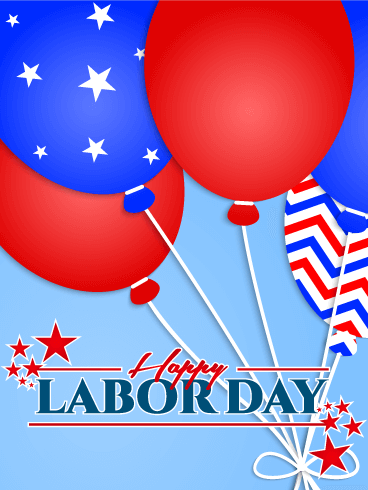 To help your loved ones have a fun and joyous holiday celebration, send this Labor Day card! The sunny beach scene and relaxing people will show that this holiday is a time to kick back and enjoy the weekend with those you love! Who doesn't love a day off of work? 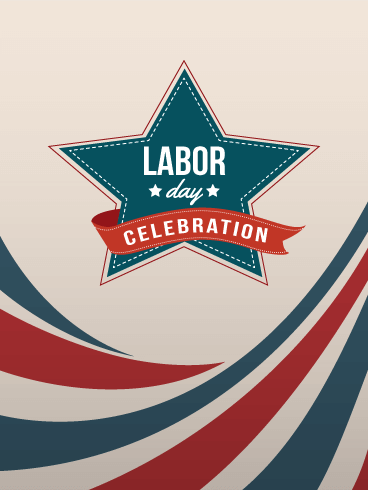 As Labor Day approaches this year, make the most of your time away from work with a fun-filled celebration! 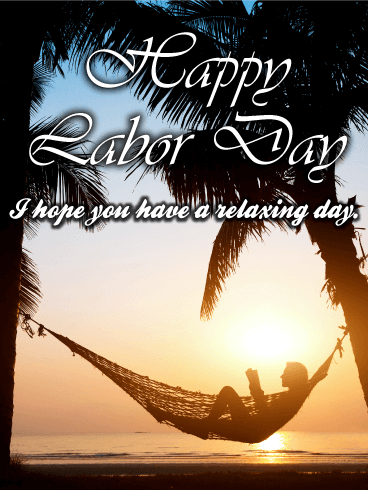 Use this Labor Day card to start your holiday celebrations with your closest friends and family by sending wishes for relaxation and happiness. 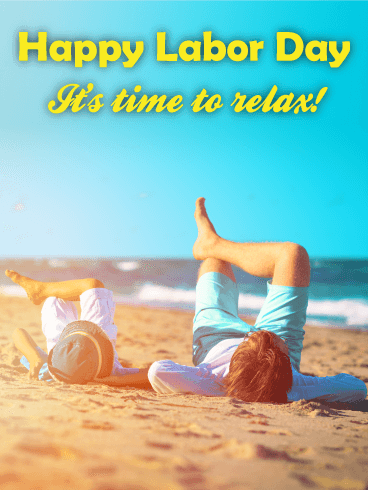 With the stress-free picture on the card, they are sure to have a holiday that is relaxing and fun! 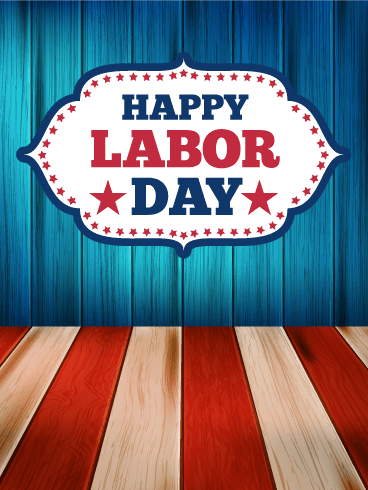 Labor Day was created to honor and remember the hard work of Americans through the years, but its celebrations are all about leaning back and taking it easy. As this holiday approaches, use this Labor Day card to celebrate with your family and friends! Wish them a happy day, relaxing in the sun and making the most of this work-free holiday! Our great country was built on the shoulders of people who labored long and hard through many decades. 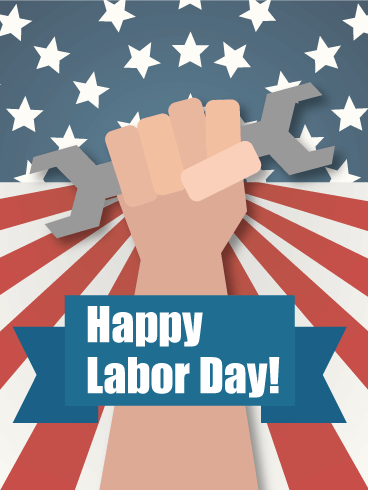 This year, celebrate this hard work with this Labor Day card! The red, white, and blue colors symbolize the results of this labor and the legacy that was created. Send this card to your friends, family, and coworkers to celebrate the work that created America's foundation! Do you know anyone who has contributed to the work that built our country? Whether they work as a solider, business owner, police officer, firefighter, construction worker, teacher, or office worker, they deserve your thanks! 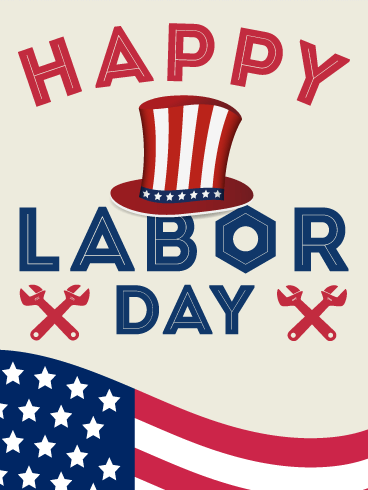 To show your appreciation, send this Labor Day card with a sweet thank you message and help this Labor Day be the best one ever! How do you celebrate Labor Day? 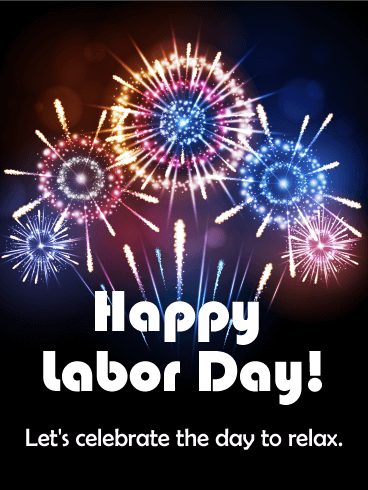 This year, add a new element to your celebrations by sending this Labor Day card to your family, friends, and coworkers! The American flag design will show how our country was founded on hard work and dedication, while the hand and wrench will show how that legacy continues. 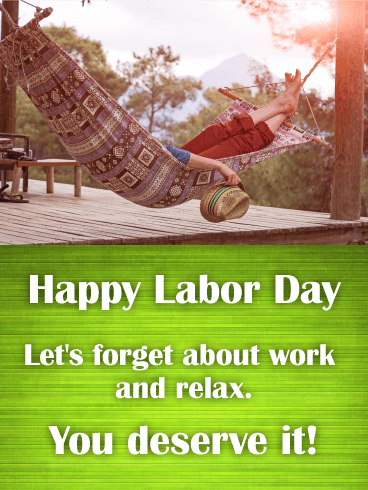 Send this card to say, "Happy Labor Day!" today!